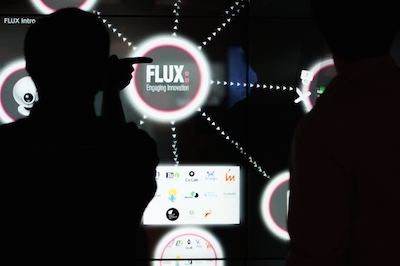 A number of new retail technologies and applications, from a Virtual Style Pod to Google Glass, were showcased at the FLUX Innovation Lounge this week. Hosted in East London by boutique design house of technology and communication architects, Engage Production, a number of press including Retail Technology were given hands on access to some of the innovations that could influence the development of digital retail technology. “We have created an environment where we can take people through retail technology-enabled experiences, so they can see how they be applied in the real world,” said Andy Hasoon, Engage Production commercial director. The showcase used projectors, touchscreens, mobile device interactivity and the new generation of wearables to illustrate how technology could, as Hasoon described it, enable “one foot, three feet or 100-foot engagement” with consumers by retailers. “Mobile or innovations like Google Glass communicate within a foot of the customer, while digital screens instore or projections onto even buildings expand the field of communication,” he added, highlighting The Virtual Book created by the agency for luxury retailer Chanel. The innovative display relies on interactive projector and gesture technology and to provide Chanel with a digital format for its magazine content, but in a way that lets customers to interact with it as if it were a book, allowing them to virtually turn its pages. Hasoon pointed out that the networked virtual display system also offers the retailer a new way of keeping traditionally printed or digital store collateral up to date from a central location, like head office. David Wilson, Engage production director, suggested the combination of augmented reality (AR) and a new generation of wearables, including Google Glass could supersede current personal computing devices. He confirmed the agency is working with a number of eyewear manufacturers to incorporate the AR Glass technology into functional designs. And he added that retailers would have to prepare for consumer adoption of this new communication medium. Engage also displayed its Fashion 3D Virtual Style Pod, built in partnership with Space3D, which was launched in a Abu Dhabi shopping mall last year and re-launched in Amsterdam at ISE 2014 in February 2014. Steve Blyth, managing director of Engage, reported that the virtual fitting room system had already received good feedback from the retail brands involved including Alexander McQueen, Diesel, DKNY, Hackett and Jimmy Choo. Stepping in front of the Pod and interacting with its software via a supplementary iPad, 3D imaging cameras are used to enable customers to experience a high tech full-body image that allows them to virtually ‘try on’ high fashion outfits. And the clothing appears on image of the user’s body in a 360-degree virtual reality (VR) display. Other interactive experiences included a MakerBot desktop Replicator 2 3D printer provided by iMakr, which makes it easy to turn data into matter with 3D printing and a 3D scanner. A new app with an in-built 3D scanning feature showcased the latest room and interior design app software capabilities. And a giant MultiTouch interactive wall hosted the I-Land workspace designed to provide a collaborative project workflow for data gathering and visualisation of enterprise projects. The wall was also used to highlight the Adidas miCoach interactive fitness application used by the sports brand in its stores and as a downloadable app, with wearable devices. Blyth added that the results of front and back-end systems development and instore testing were also fed back into the design process for its shoes and personal trainer app. The ‘ultra connected customer’ is the catalyst for all of these technology concepts according Tom Belgeonne, co-founder and chief executive officer of marketing technology company Co.Lab. His company tailors interactive mobile engagement for events, out-of-home, print, retail and social media using multi-display marketing and advertising. “Retailers still struggle with the fact that they have no way to link sales from customers that may interact with the brand instore, but then purchase later online. These transactions have no unique identifier,” Belgeonne said, adding that this was where mobile connectivity and apps come in to bridge this gap. Blyth urged retailers to embrace new channels of digital communication. “We are good at accelerating the development of innovative technologies like these for real-life applications so retailers can deploy them quickly,” he concluded.